Soak beans for 2-3 hours. Keep aside 1/4 of the beans.Take the rest of the beans and add cloves,ginger,garlic and salt. Grind it into smooth dough without adding water. Now add chopped onions,green chillies,curry leaves,mint leaves,coriander leaves and beans which was kept aside. Mix throughly and make small patties and deep fry. good girl yila manci recipes chestoo undu he hee my all time fav. saritha mouthwatering. looks yumm..have been wanting to try this for a long time...will do it soon.. These vada's will be very tastier right?? 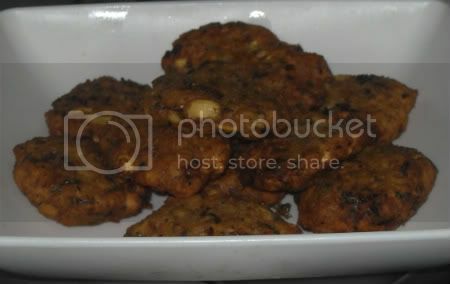 Crispy vadas looks delicious, just love it..
Looks lovely, nice to have with a hot cup of tea. Send some across. By the way vadas are looking sooo delicious!!!! never thought of using black eyed beans in masala vada..im sure it tastes awesome! Wow - that looks awesome. I didnt know you could do it with black eyed beans... Thise beans are very healthy! On this rainy day, wanna grab one!Looks yum! Droolz! Both masala vada and mirchi bajji look appetizing and gobbleworthy! Perfect for snacks time and for kiddos! Vadas looks great and yummy. Perfect crispy vadas, looks so nice. Liked ur mirchi bajji too, looks awesome.